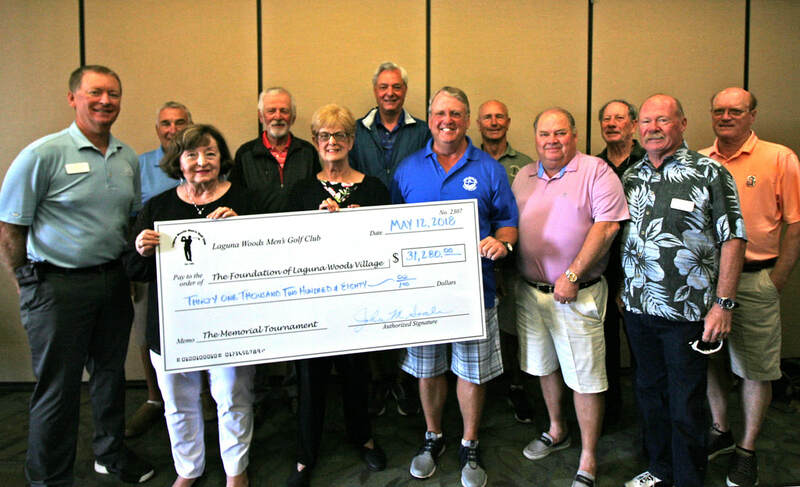 Over the years, special events, clubs and organizations of Laguna Woods have donated thousands of dollars to The Foundation. In addition, we would like to honor some special donors. 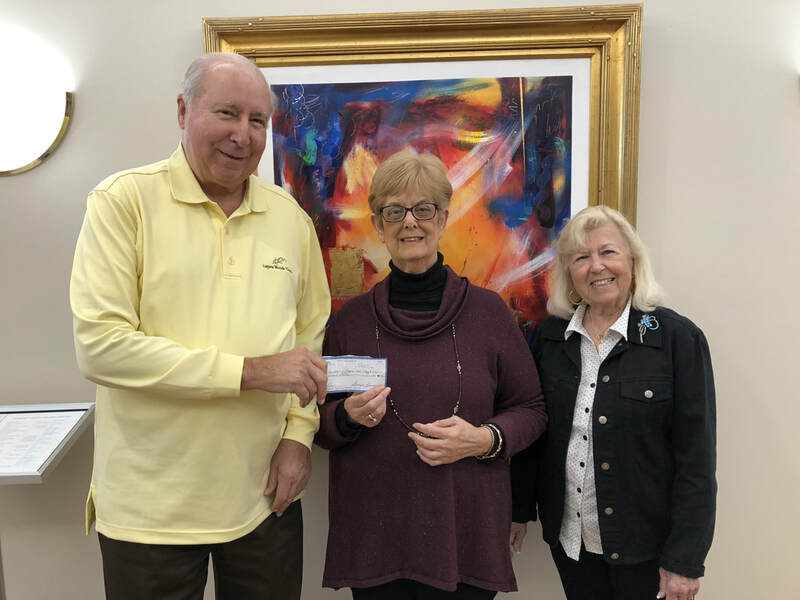 ​Theatre Guild Board Members present $1000 check to Marcy Sheinwold, President of the Laguna Woods Foundation on 4-18-19. Clubs keep the holidays bright! 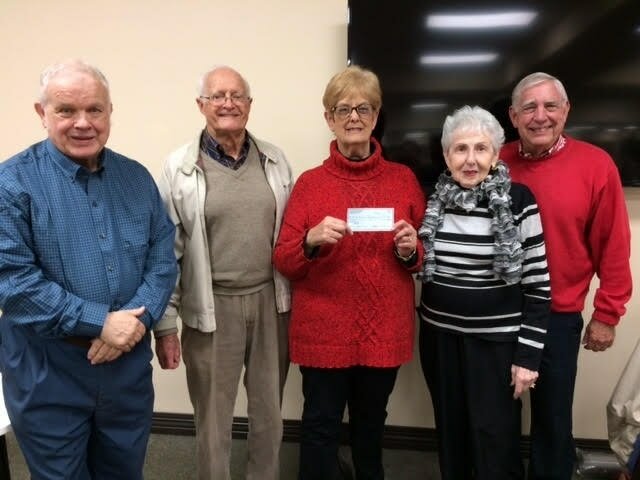 Keeping the holidays bright for all Village residents was made possible this year by the many donations to the Foundation by Village clubs in 2018. This year, club donations permitted the Foundation to adopt over 150 seniors in the Village who received special “holiday cheer.” With the help of Social Services and the South County Outreach food pantry, the Foundation was able to identify those in need of such cheer and provided Village seniors with both a special holiday meal and gift, something they would not have had otherwise. The Foundation is particularly grateful for all these club donations and would like to acknowledge the contributions of the following: Aliso Club, Aquadettes, Arts Association, Duplicate Bridge Club, California Club, Ceramics Club, Chicago Club, Chinese American Club, Friends of Bridge, Garden Club, Korean-American Club, Lawn Bowling Club, Men’s Golf Club, Needleworks Club, New York Club, Nifty’s Club, Old Pros, PC Club, Players Club, Porcelain Artists, Potters and Sculptors, Publishing Club, Rock n’ Rollers, Rosh Chodesh, RV Wheelers, Sewing Supers, Sunday Discussion Group, Sunshine Performance Club, Ukulele Club, Village Chorale, Village Library, Women’s Golf Club. 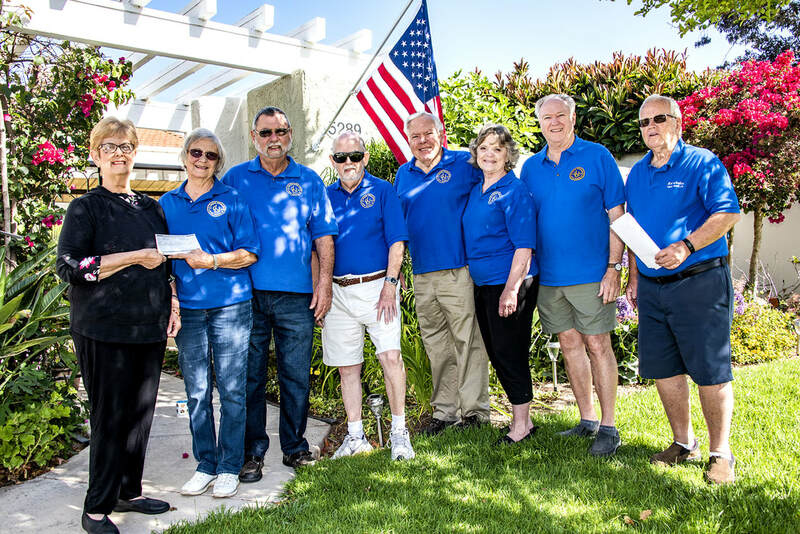 The Bridge Club made a $7,500 donation to the Foundation of Laguna Woods Village in 2018. 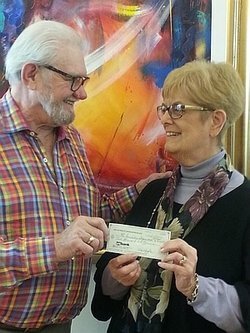 Don Joynt, the club’s president, presented the “check” to Pat Leftwich, the foundation’s treasurer. The Sunshine Performance Club donation $1000 to the Foundation. At their 2018 Memorial Golf Outing, the LWV Men’s Golf Club’s charity efforts raised over $31,000 to support services provided by the Foundation to Village residents. Members of the Club’s board of directors are seen with their generous check. Pictured left to right: Marcy Sheinwold, Dee Wennerstrom (President RV Wheelers), John Huber, Mike Epstein, Bruce Block, Linda Huber, Richard Smith, and Doug Gibson. At its recent May meeting, the RV Wheelers had their first auction in many years. Members donated gently used items to be auctioned with the proceeds going to the Foundation. These items included dishes, folding chairs — even a tow bar system. All in all, it was a fun evening with lots of laughs with $554 raised for the Foundation. The Rock n’ Rollers Club presented the Foundation with a $2,000 donation check. Pictured are John Lesak, club President, and Sharron Larsen, Treasurer. The former Chorale Club of LWV donated $3700 to the Foundation. Shown here are Joyce Nanchy (President) and Mary Beth Clausen (Treasurer). 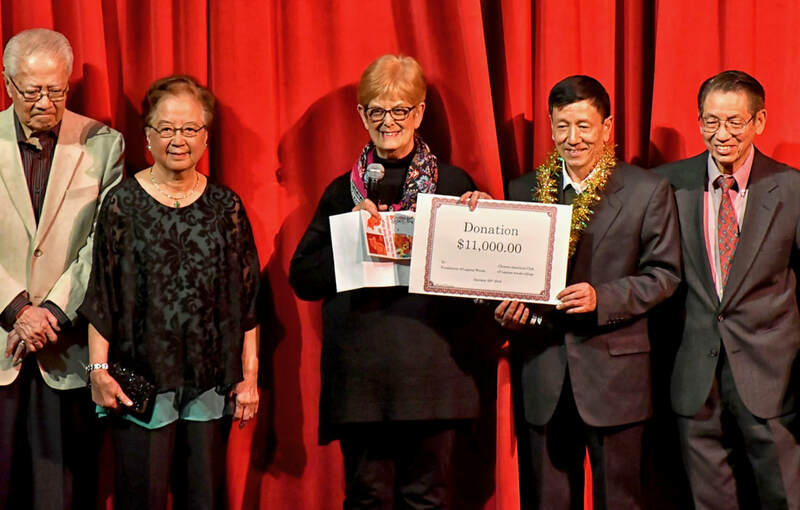 The Chinese American Club donated $11,000 as part of their celebration of the Chinese New Year. On Saturday, May 13, the Laguna Woods Men’s Golf Club hosted its 9th Annual Memorial Golf Tournament. About 300 golfers and their guests attended the Tournament, including several representatives from the Village Boards of Directors. All net proceeds from the Tournament—a whopping $43,519—were donated to the Foundation of Laguna Woods Village. Special thanks to Presenting Sponsors B. Foster Construction and Solar Optimum; Golf Hat Sponsor Village Real Estate Services; Shirt Sponsors Saddleback Golf Cars and Saddleback Memorial Hospital; Championship Sponsors Letner Roofing Co., National Cooperative Bank and Waste Management; Professional Sponsors El Toro Water District, Emerald Acquisitions, Heflin Real Estate and Las Palmas; Towel Sponsor Farmer’s Publications; Putting Contest Sponsor BrandTailers; Scorecard Sponsor Disckons Air Conditioning and Heating; and Hole-in One Sponsors Audi Mission Viejo and Volvo Mission Viejo. Left to right: Lori Moss, Community Manager; Dave Schmidli, Director, Laguna Woods Men's Golf Club; Bill Blaine, President, Laguna Woods Men's Golf Club; Marcy Sheinwold, President, The Foundation of Laguna Woods Village; Tom Sirkel, Director, GRF; and Brian Gruner, Recreation and Special Events Director. 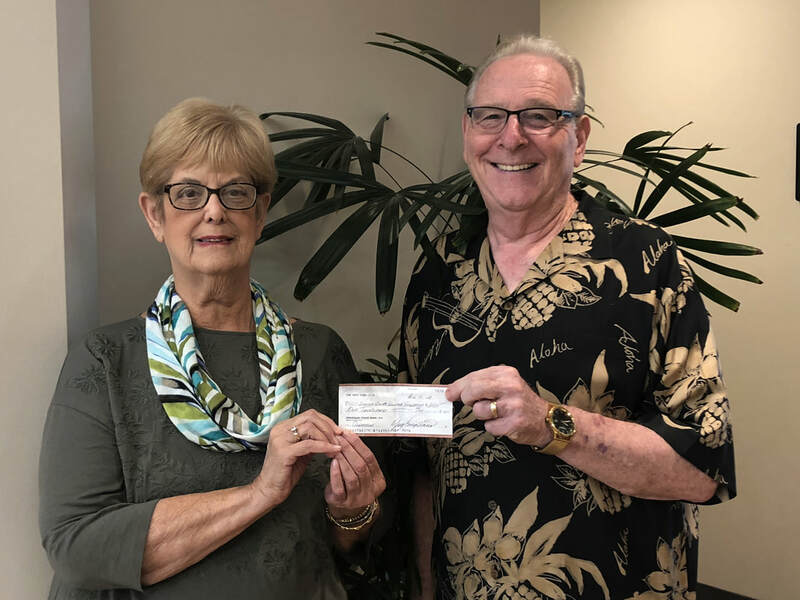 John Perak, President of the Old Pros, presenting a $2,000 check to Marcy Sheinwold, President of the Foundation, to support Foundation programs. 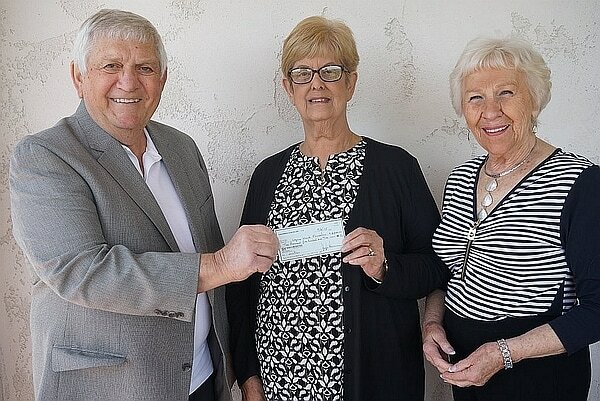 The Friends of Bridge donated $1800 this past December to the Foundation of Laguna Woods Village. 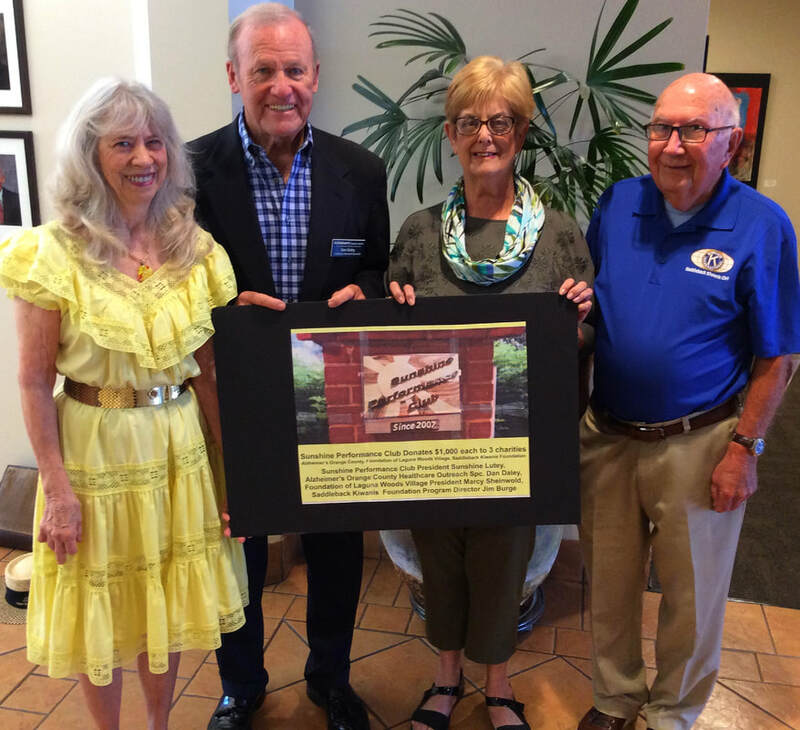 From left to right: Larry Pritchard, Scorekeeper; Eric Lemke, President; Marcy Sheinwold, President of the Foundation; Muriel Cohen, Secretary; Pat Donahue, Treasurer. 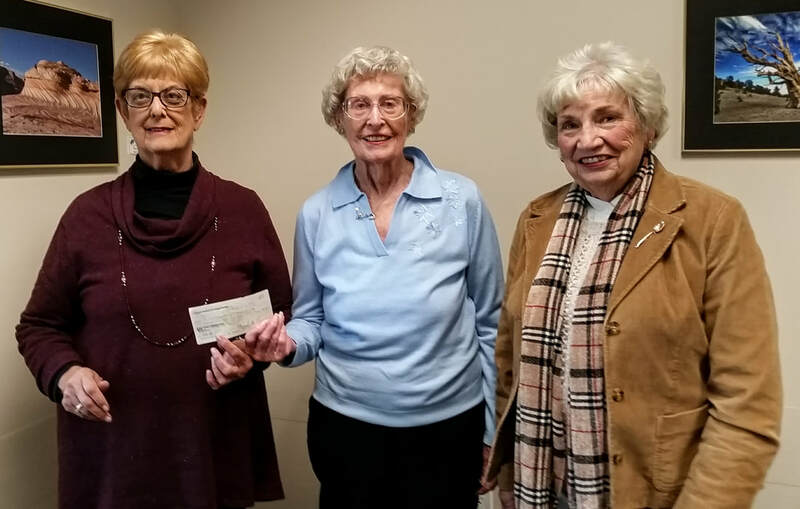 $300 donation from the African-American Heritage Club with, left to right, Rose Williams, Vice President, Marcy Sheinwald, Foundation President, and Sandra Towens-Ward, Treasurer. The LWV Korean American Association recently donated $1,000 to the Foundation to assist needy residents in the Village. The money was raised at a golf tournament hosted by the group on March 12, 2017 where 70 men and 48 women participated. A dinner was also held in Clubhouse 5 which included a reward ceremony and raffle prizes. The group hoped that the money raised would bring smiles to a few faces. "We, the Village Publishing Club, are proud to be a donor to such a wonderful organization. The Laguna Woods Foundation is doing amazing things for our Village." 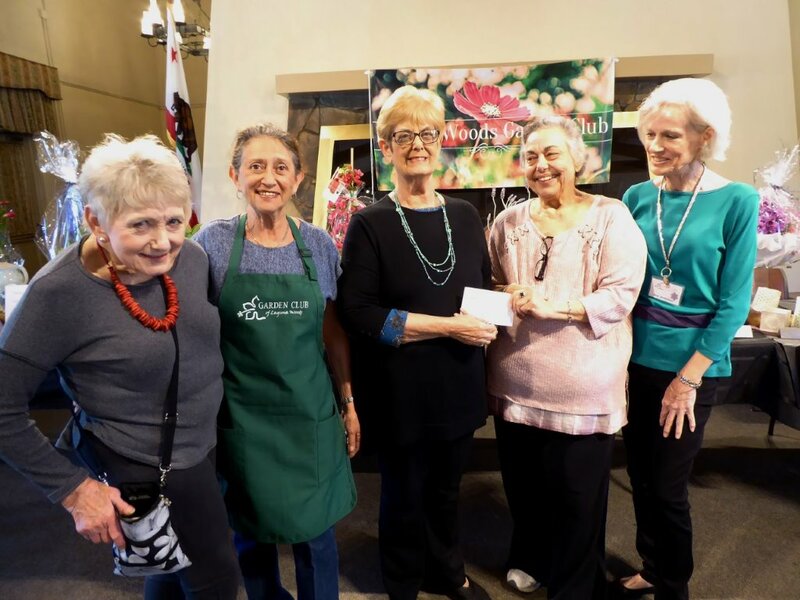 Some of our Clubs, like the Laguna Woods Bridge Club and the Sewing Supers, donate time during the year to having special events or raffles to benefit The Foundation. The Villagers are always the winners in these events! To make a donation in honor of, or in memory of someone, please use the How You Can Help tab. If making a donation by credit card, first fill in the amount of the donation in the place indicated, and fill in your card information. If you prefer to use Paypal then click on that option. Be sure to click on the blue Donate Now button to submit your donation. And Thank You!